Missouri State assistant women’s basketball coach and NCAA Division I women’s basketball all-time leading scorer Jackie Stiles joined the Women’s Basketball Hall of Fame as part of its 18th induction class Saturday (June 11) in a ceremony at the Tennessee Theatre in Knoxville. Now entering her fourth season as a Lady Bear assistant, Stiles enjoyed one of the greatest playing careers in women’s basketball history at Missouri State, culminating with the program’s second Final Four appearance in 2001. As a senior, Stiles was named a first-team All-American by Kodak and the Associated Press, and was the Women’s Basketball News Service Player of the Year after finishing her collegiate career with 3,393 points, a record that still stands. Her 1,062 points that season remained the only 1,000-point season in Division I women’s basketball history until 2014, and still sits atop the single-season scoring list. She also holds the No. 4 single game total with 56 in a March 2000 contest against Evansville. Stiles was also named the Honda Awards program Player of the Year and was the recipient of the coveted Honda Awards Broderick Cup, as well as the Wade Trophy as a senior. A four-time Missouri Valley Conference first-team selection, Stiles earned MVC Player of the Year honors as a sophomore, junior and senior, and the award for the league’s most outstanding player now bears her name. 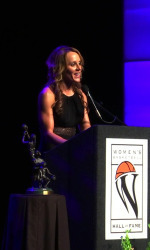 Stiles made the transition into the professional ranks later that year as the Portland Fire picked her fourth overall in the 2001 WNBA Draft. She earned a spot in the league’s all-star game that season, and received 32 out of 60 possible votes from sportswriters and sportscasters in being named the league’s Rookie of the Year. Joining Stiles in the Class of 2016, which brought the Hall’s membership to 151, are Sherri Coale (coach), June Courteau (contributor), Joe Lombard (coach), Bill Tipps (posthumously) (contributor), and Natalie Williams (player).